For sixty-six years, Washington Memorial Chapel has presented the world’s finest carillonneurs. This magnificent music in the pastoral setting of Valley Forge National Historical Park continues to be a source of great enjoyment and inspiration for area residents and visitors from all over the world. 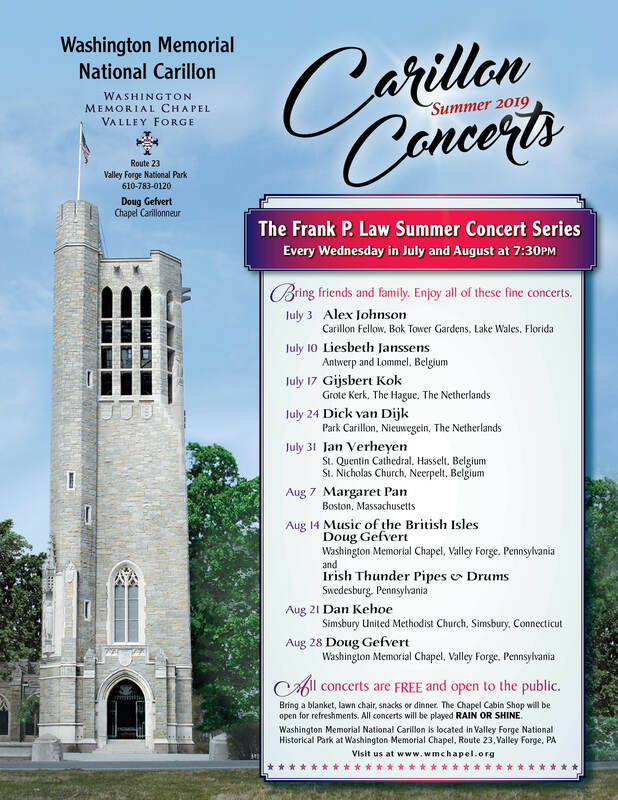 Our annual July-August Wednesday evening concerts feature performers from Belgium, The Netherlands and the USA. As always, we welcome some carillonneurs new to Valley Forge, as well as welcoming back returning favorites. And the ever popular Irish Thunder Pipes & Drums performs again on August 14th. All Wednesday evening concerts are played rain or shine. This year the Chapel will continue our Sunday Afternoon Carillon Playings in the Spring and Fall. Each Sunday in April, May, June, September, October, and November, 20-minute concerts will be performed live at 1:30, 2:30 and 3:30 p.m., weather permitting. For more information on the Carillon and The Veterans Wall of Honor, contact Carillonneur Doug Gefvert by phone at 610-265-5211, or by email.